Ethan Lauder works in relief on Thursday evening. Cole Dyer launches a pitch to the outfield on Thursday evening against Circleville. Reid Shultz throws a pitch against Circleville Post 134 on Thursday evening. 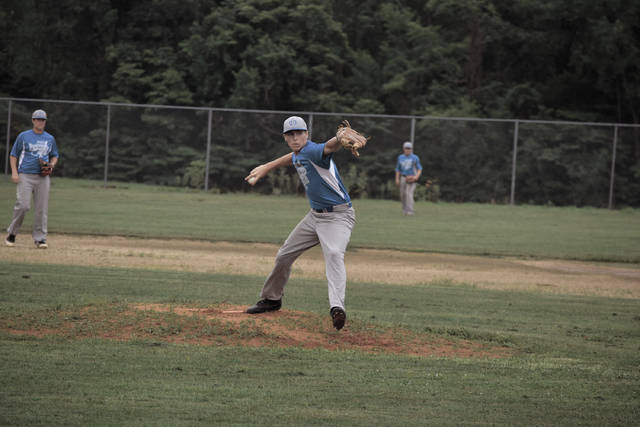 LUCASVILLE — Over the course of the 2018 season, the Portsmouth Post 23 Senior Legion unit has proven itself as a tough out in American Legion competition. However, the Circleville Post 134 Panthers have proven to be mighty tough in their own right. 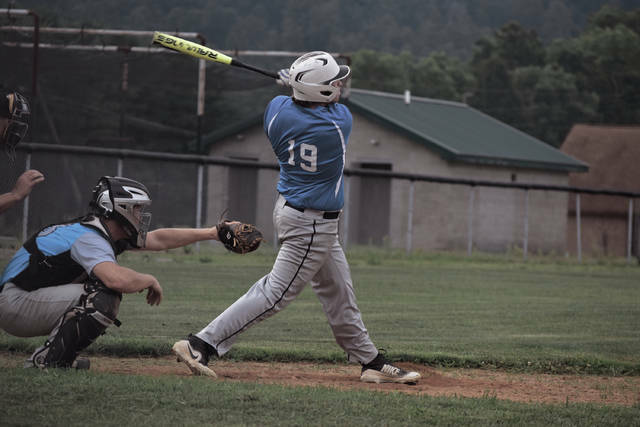 On Thursday evening, Post 134 continued its tear against its South Central Ohio League (SCOL) competition by splattering 11 runs on 13 hits as Post 23 fell by an 11-1 tally in six innings to Post 134 on Thursday evening in a contest that was moved from Branch Rickey Park in Portsmouth to Valley High School in Lucasville due to poor field conditions at the former facility. For Post 23 head coach Matt Miller, the deep and talented Post 134 lineup proved to be too much, especially for a Portsmouth unit that didn’t play at its very best on Thursday evening. From a defensive standpoint, Post 23 proved to be solid all game as Portsmouth, whose only error came in the bottom of the sixth frame on an off-balance throw from the infield, committed less errors than Circleville did behind the strong efforts of guys like Isaiah Greene, who tracked down three well-traveled baseballs for outs in center field. However, Post 134, behind a home run, a double, and three hit by pitches, was able to score five runs over the first inning and a third, and from there, Reid Shultz was forced to give way to Ethan Lauder. However, Circleville, who ultimately scored six runs in the first two frames of action, had done all the damage that it needed to do. Greene and Will Darling, however, were bright spots. In addition to the former’s fielding abilities out in center field, Greene went 1-for-3 at the plate, while Darling, who came up to the plate with Lauder standing on third base after an error, brought the senior in with a one-out single back up the middle. The junior-to-be finished the day by going 1-for-2 with a walk and an RBI. One walk apiece by Jake Ashkettle, Cole Dyer, Tyler Speas, and Jarrett Stamper rounded out the Post 23 output. 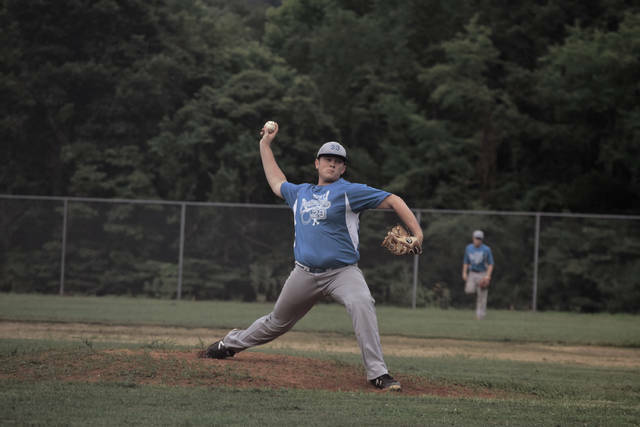 Post 23, who fell to 9-9 with the loss, collected a 10-7 victory over the Huntington Hounds’ 16U program on Friday morning in Ashland, Ky. as part of the July 4th Holiday Tournament. Portsmouth’s second game against South Charleston (W. Va.) Post 94 was postponed due to rain, so Post 23 will play the Hounds’ 18U program on Saturday afternoon at 12 p.m. and will play Ashland Post 76 and South Charleston at 10 a.m. and 12:30 p.m. on Sunday to conclude the weekend. A further recap of the Post 23-Hounds 16U contest can be found online. It is included as the centerpiece in our Saturday edition but in a condensed manner.